Australian Labradoodles come in all sizes. We put them into three size categories. The height of a standard Labradoodle begins at 21 inches at the shoulder and goes to 24 inches. We have met slightly bigger boys. Standards begin at about 45 pounds and go to about 65 pounds. Our Guinevere is a wonderful standard of 60 pounds. She is our retired girl. Her daughter’s puppy will be somewhat smaller. The height of a medium Australian Labradoodle ranges from 17 to 20 inches at the shoulder. The medium dogs are usually between 30 and 40 pounds. Our Lilyanna, Savannah, Lexi and Barnaby Tango are medium Australian Labradoodles. Most of the litters that we are currently expecting are in this size range and slightly smaller. The miniature Australian Labradoodles range from 12 to 16 inches at the shoulder and are from 17 to 25 pounds. As you can see this is not a five pound dog but a sturdy fellow who can still do long hikes but is often able to go on a plane as carry-on. Our Etta is a small girl at only 13 pounds. She gave us very sturdy puppies who have all been in the 15 to 20 pound range. Ginny and Sandy, her mum. 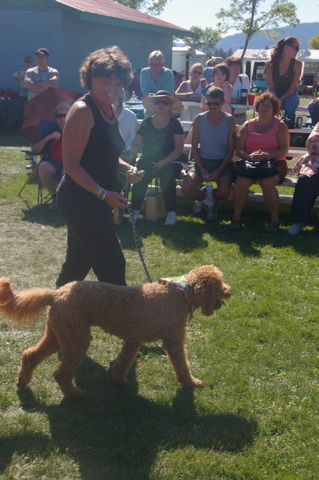 Ginny is a small standard Australian Labradoodle mother bred by Canadoodle Australian Labradoodles. 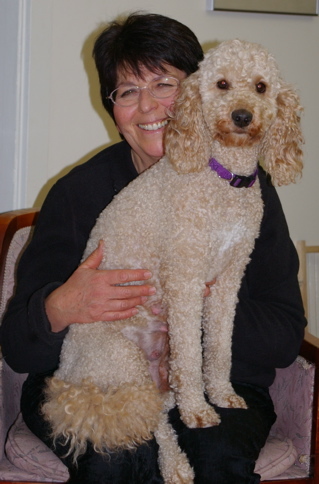 Lilyanna would love to be a lap dog but as a medium Australian Labradoodle she really isn’t.